The most acclaimed British movie of recent years; the story of the rivalry between two British athletes as they prepare for and participate in the 1924 Olympic Games. Each man is spurred on by a personal social handicap. Harold Abrahams, an ambitious Jewish outsider, runs because of the racial prejudice he experiences at Cambridge University. Eric Liddell, the Edinburgh son of a Scots missionary in China, runs for the greater glory of God. The film charts their lives in the years immediately preceding their historic races in Paris. A superb film, enhanced considerably by the music of Vangelis. Ben Cross plays Abrahams, Ian Charleson is Liddell. 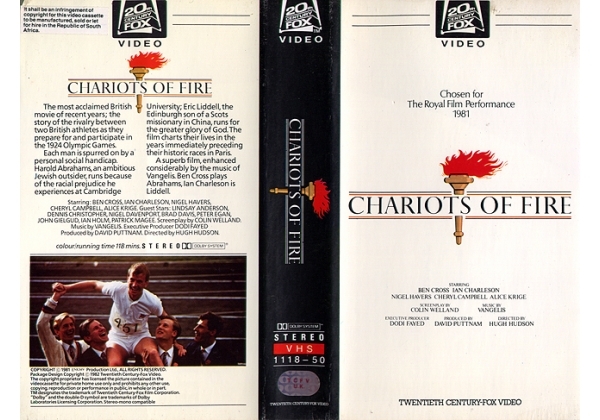 Or find "Chariots of Fire" on VHS and DVD / BluRay at Amazon.